Accommodations: Attendees are responsible for their own meals. Packing a lunch is recommended and there is a picnic area nearby. Attendees are invited to join lunch after class with Ellen. Course Materials: Attendees should bring a sense of humor, write-in-the-rain notebook and writing utensil. Plant ID book(s) and a camera are optional. Class Description: One half (1/2) day field class at Sharon Hollow, which is one of the top natural sites in Michigan’s Lower Peninsula. 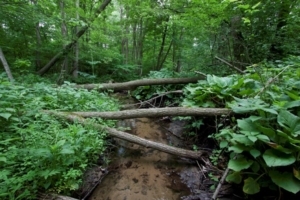 The preserve includes rich woods, stream sides, and hardwood swamp with groundwater seeps and springs. Boardwalks provide access through much of the wetter areas. Plant identification will include common, rare, and unusual species occuring in wetlands and transitional habitats. Instruction will include discussion of common and scientifc plant names, wetland ratings, and floristic quality index ratings. This is a field course, participants should be prepared for varying field and weather conditions (rain gear, sunscreen, bug spray, etc. ).